Combine your love for your favorite drink with your love of music with drinkware featuring designs for musicians and music lovers. Choose from a range of coffee mugs, travel mugs, water bottles and frosted beer mugs and beer steins. A range of coffee mugs featuring musical designs. Available in different styles, colors and sizes. Drinking glasses with music designs. Show your love of music while enjoying your favorite cold beverage. The music lover can take their hot drink on the go with a travel mug - available in white or stainless steel. The music star can stay hydrated during rehearsals, music lessons and when performing live. 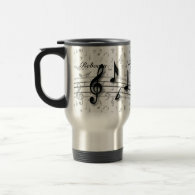 For the musician who also loves to drink beer, beer steins and frosted beer mugs with unique music themed designs.